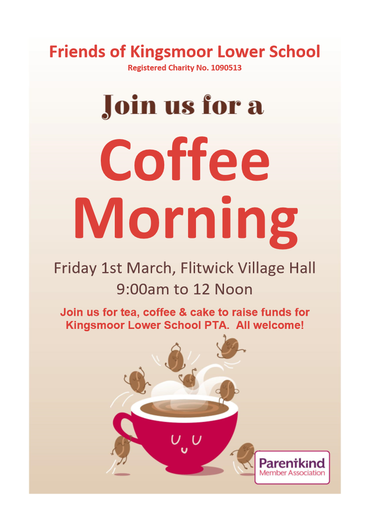 Every Friday, Flitwick Village Hall is open to the community for tea & coffee, whilst the market is trading. The PTA have been invited to run a cake stall in order to raise funds for Kingsmoor. If you are able to donate some cake or similar sweet treats please can you drop them off at school on Thursday 28th February. Everyone is welcome at the coffee morning so please spread the word and we look forward to seeing you there!